Last weekend I hit the pumpkin patch for one of my favorite fall rituals. It was crazy crowded since it’s the weekend before Halloween but it was totally worth the crowds. 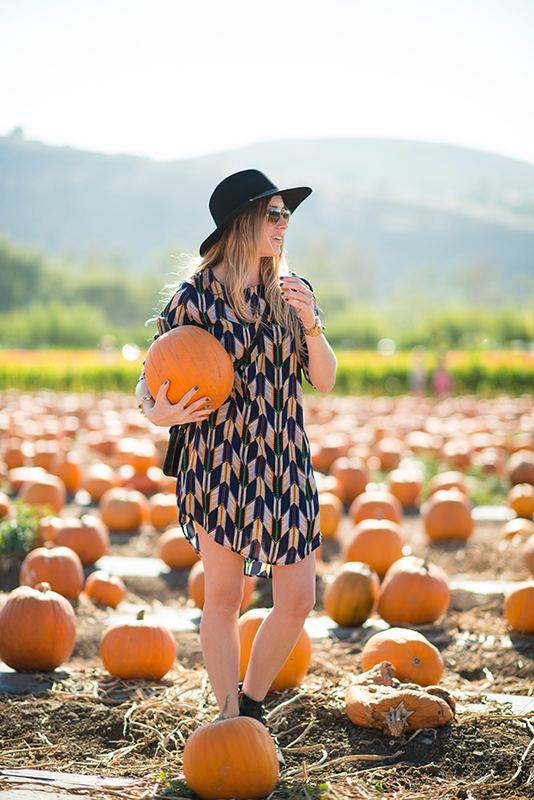 I kept my look simple with this loose dress and boots to keep it super casual for the farm. I came home and started the carving process. Let me just say, a little bit harder than I remembered from the last time I carved a pumpkin! But, I did finish and so happy with how they turned out. I am currently working on getting my costume ready for next week. Would love to hear what you are dressing up as. Hope everyone is having a great week. sheree@itsnotthatdeep - These pics are awesome..I just did similar ones on my blog with my kids..loving that dress!!!! Luba - Wonderful pictures Kim ! marina - i like this post..so funny and amazing.. you look so fresh..
Tia - Such a fun post! Love the geometric pattern! Q - such a cute dress!… works perfect with the background!. lizette rosser - love your dress! the print and colors are gorgeous!!! Kiara - Awe… love this. That is actually the perfect pumpkin patch! Rachel - Looks like you had fun! Cute dress! I love your style. Bella - Amazing pumpkin picking outfit! Love the shapes 🙂 Those pumpkins are carved beautifully! Donna - Obsessed with your Everly dress – they are some of my favorite dresses!! Pauline R. - j’adore tes chaussures elles sont vraiment trop belles ! Amanda - The cutest! I want to go out and take pumpkin patch photos! Francesca - I love this! Rose - Your pumpkins look SO good-and I love the pattern on that dress!! Jennifer - You are adorable lady! Carelia - I love pumpkin patch pictures!!! You look stunning with this bohemian look. Great photos. Mysmallwardrobe.com is my blog, you are welcome to visit anytime.